Before Debbie Macomber took the NWS stage on May 7, Charlie VanderKlipp, a Traverse City West high school student who participated in the National Writers Series’ Front Street Writers program, read an excerpt from his nonfiction work, Ode to the Horror Film, in which he defends and professes his love for scary movies and horror cinema. Macomber is definitely trending – in the publishing world – her popular work includes fiction, nonfiction, children’s books, knitting and cookbooks, and inspirational books. Macomber has more than 170 million copies of books in print; she’s published 14 series encompassing close to 80 books; 70 other stand-alone books; plus several anthologies and collaborations. Since 1986, she has also released a yearly Christmas-themed book. This writer works hard to be so prolific. A typical day begins at 4:30 a.m. She spends two hours reading the Bible and writing in her journal. Then she swims a half-mile, eats breakfast and goes to her office. She reads “every single piece of mail that comes in,” and cited several hilarious ones at the National Writers Series event. I love your books so much I’m willing to pay for them. When’s your next book coming out? I’m 85. Hurry! I’ve read every one of your books and I haven’t liked a single one. Macomber explained that when she starts to write a book, she sits down with a calendar and records how many pages a day she’ll have to write in order to make her deadline. It’s usually between 15 and 20. She has multiple people check her “atrocious” spelling and other errors that come from being dyslexic. “‘Such’ and ‘just’ are the same word to me,” she said. The author is known for her happy endings – at least where everything works out in the end – despite the sometimes rollercoaster of struggle in her characters’ lives. This vacillation between conflict and resolution seemed to play itself out on her path as a beginning writer. Once Macomber had spoken her dream out loud, she was determined to defy the odds and become a writer. She knew that through steady work she would make it a reality. Finally she was able to rent a typewriter for $100/month, and began writing while raising four small children. She felt guilty about not contributing to the household income, but she kept at it for over two years. When her husband, after struggling with the monthly bills, told her she needed to get a job, Macomber tossed and turned all night. She asked God to take away the dream. But then, in the morning darkness, Wayne told her to keep on trying. With his support, she continued writing for a few more years, this time selling “little articles” for $5 or so. This was just another twist on the ride. Macomber reworked the story and sent a proposal to a publishing house, asking if they would look at the manuscript. She waited and waited for a reply, but got antsy and sent the package off anyway. Incredibly, the publishers’ reply came that afternoon: “Do NOT send us a manuscript.” Macomber went into a funk, having spent $10 on postage to send a manuscript to a publisher that did not want to see it. Three weeks later, her writing rollercoaster took another turn. She received another notification from the same publisher; they wanted to publish Macomber’s book. 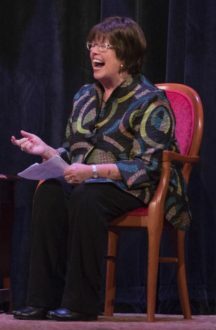 Many of the 400-plus people at the National Writers Series event – 95 percent women and 5 percent supportive men – share Macomber’s love of knitting, which is one of the key parts of her “Blossom Street” series. A yarn shop is integral in the characters’ lives; Macomber owns her own yarn shop in Port Orchard, Washington, which shares a name with the fictional one – A Good Yarn. Macomber fan Kathy Doelker, of Traverse City, can relate. “When I was a little girl, I had low self-esteem,” Doelker said. “I learned to knit in 4-H and then formed relationships with the other girls.” She knitted a baby blanket from a pattern in a “Blossom Street” book that promised to be easy, which wasn’t quite the case. But again, life imitated art, and friends and strangers helped Doelker with the blanket, just as the women in the fictional knitting group help each other. Macomber noted that her career took off when she combined her “passions of writing and knitting. Her latest published book, Last One Home, was released in March. Macomber said the idea for Last One Home was born at a hoedown-themed charity event she attended with Wayne. The hostess was wearing a shirt that said, “Future Homeowner.” The woman explained how she was putting in 500 hours of work to qualify for a Habitat for Humanity home-an opportunity that shows up in Last One Home. Musing on her recently finished book, The Girl’s Guide to Moving On, Macomber proclaimed, “It’s really good.” With this writer, it’s another trending bestseller, coming out just around the bend.